D-5084, Red Color, Odd Shape Cards, Hindu Cards, Designer Multifaith Invitations. 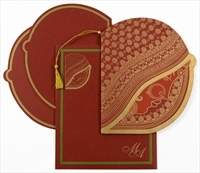 Beautiful Bride shape card. Inside interleaf has border in green and gold. Inserts also in shape of card with green and gold border. Envelope too follows the same theme. 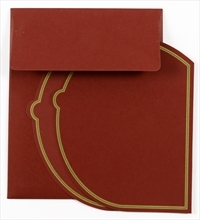 Red paper (260gsm) for the card, inside interleaf, 2 inserts and mailing envelope. Silk Screen Printing in Godl color.